Grace and Zayday are out on a food run at a creepy, run-down and empty convience store that would make anyone cringe when they are confronted by the red devil. Quick on her feet, Grace yanks out her tazer gun and fires away at the assumed serial killer. Zayday notices from the adjacent aisle and dumps a shelving unit down on the attacker. Eager to see who is behind the killings, Grace pulls back the devil’s mask to reveal a local school dork just dressed up to show his mascot skillz. Chanel and Chanel #5 are in the meat locker where the missing bodies used to be house and are arguing about where they could be. Chanel #5 seems to have finally had enough of Chanel’s bullsh*t and simply tells her that since she is the president she should just deal with it herself. Chanel #5 proudly exits the freezer much to Chanel’s disapproval, as she threatens to bring her down. 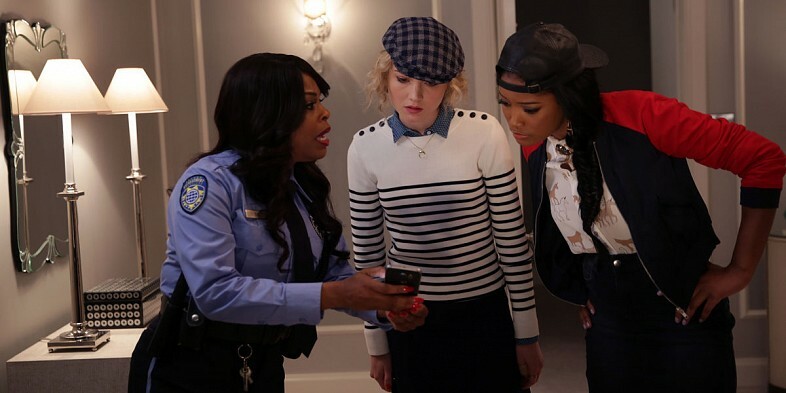 Zayday and Grace acting on suspicions that something grim may have happened to Chanel #2 sneak into her room to search for clues. 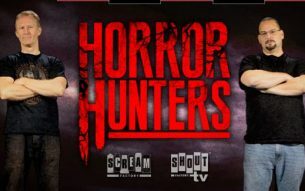 When the duo finds a mysterious stain on the carpeting, the security guard Denise strolls in with a spray bottle full of some weird concoction that reveals the stain is indeed blood. Apparently, Denise uses the spray bottle to make sure no horsey-sauce made it’s way onto her favorite Arby sandwiches. 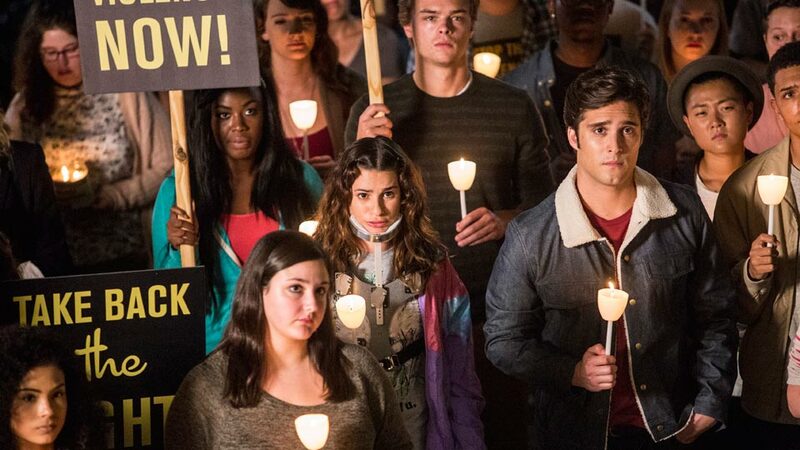 The college holds a special vigil for the recent slain students, where Chanel runs into Chad in hopes to rekindle their relationship. Chad, broken up about his late best friend’s disturbing “death” brushes Chanel off again because he believes her “loser” pledges are pulling her down the popularity ladder. Dean Munsch takes the stand and makes a horribly-offending speech saying that there is no serial killer and for no one to worry. The dean also announced that she is retiring the red-devil mascot and replacing it with… a smiling ice cream cone. The crowd looks on in disbelief at the Dean’s ridiculous speech at she exits the stage. In hopes to find some answers about Chanel #2, Zayday, Grace and Denise take a trip to Bel-Air to visit #2’s parents. Mr. & Mrs. #2 have no idea where their daughter could be but admit that she is a recovering alcoholic. It was also revealed that Chanel #2 was dating Chad, and he had even met her parents. While Grace is patiently waiting for her film class to start she notices something weird on her schedule. Just then, her father walks in and Grace realizes he is the teacher of her class. Infuriated, Grace confronts her father in front of everyone and storms out. But nevertheless, the class still goes on and the new-found professor plays The Texas Chain Saw Massacre to his students, which he explains is the greatest movie of all time. The new ice cream cone mascot is just chillin’ (no pun intended) in his dorm room, exciting over his new role when the red-devil makes an unwanted appearance. The devil boasts a chainsaw and cuts the poor cone in half. Hestor sneaks into Chanel’s massive closet and excitedly explores the room, pretending to be some one else. Chanel looks on from above, asking Hestor what she exactly is doing, saying that the room is quite expensive. Chanel then comes up with an idea, to give Hestor a much-needed makeover in hopes Chad will take her back now that her sorority was a less-geeky. Chanel #3 complete with her earmuffs and all, sits down with Sam to tell her her “secrets.” #3 explains that her mother had congenial visits with a mass-murderer and become impregnated with his child. And who exactly is the prisoner? None other than Charles Manson! Chanel #3 asks Sam if she would be her alibi if another murder occurs because she does not want her family secrets to bring her down. The Chanels and pledges discuss the murders downstairs and ultimately it is revealed that practically every Chanel had a fling with Chad. Chanel then interrupts the pow-wow and reveals her new project– the completely transformed Hestor. Hestor looks amazing, neck-brace free which seems to irk Chanel #5 as Chan announced that Hestor was now Chanel #6. The Dean and Gigi then burst into the house to announce that they will be moving in for the weekend to supervise the girls. Chad and all his bro’s drunkinly team up to savage the neighborhoods in hopes to bring out the red devil. The boys with baseball bats in tow start breaking practically everything in site to the tune of the good ol’ Backstreet Boys. 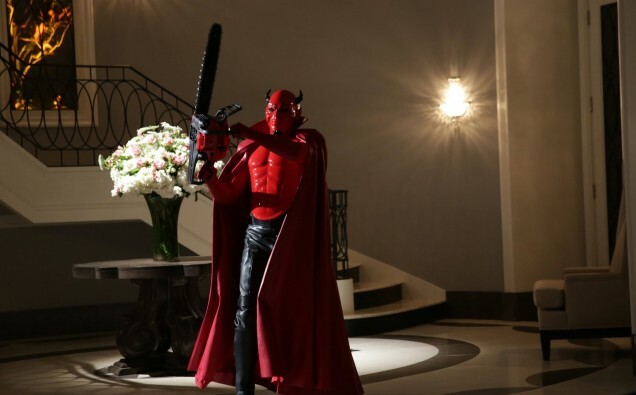 The red devil then appears carrying a chainsaw making the boys quickly run at him, only to discover that a second chainsaw-wielding devil is also at the scene. The frat boys run about with their bats which are quickly cut in half making them not stand a chance. One poor sap loses both arms in the fight and a few others lose their lives as well. Wes and Gigi enjoy a date together but Wes says he can’t really call it that since the Dean was chowing down with them too. After the awkward dinner Gigi and the Dean head to bed when the Dean reveals she needs a white-noise machine to sleep. The white-noise machine ends up being a loud audio-loop of whale’s distress calls. After Gigi asks if a different white-noise channel could be put on, she decides to sleep downstairs on the couch. As Gigi prepares herself for bed she looks up to find the red devil with his chainsaw ready to attack her. Wes hears commotion from his command-post in his car outside and breaks in only to be cut by the chainsaw. The red devil makes his escape and then the Dean suddenly makes an appearance. Wes accuses the Dean of being the murderer and the episode ends. Overall, this episode didn’t have the stamina of the first two but it still was a fun episode to watch, laced with humor and cheesy g0ry deaths. There are a lot of characters to keep track of right now which definitely annoys me a bit but some shows can pull that off well. I still have no idea who in the world the killers could be since there are like a zillion suspects but will definitely keep watching to find out. Tune in next week for my Episode 4 recap and review! I didn’t care for Scream but I like this show, it is very clever and keeps you guessing.